Part 1: What’s So Great About Our Constitution, Anyway? Many people today have a basic misunderstanding of what is meant by “American Exceptionalism”. They think that those of us who believe in the concept of American Exceptionalism simply think our country is the best, sort of like how we brag about our favorite sports team (“USA! USA! USA!”). But if everyone is exceptional, than nobody is really, right? It simply loses all meaning. On the contrary, being “exceptional” has very real meaning. Being exceptional is being rare or unusual, as in “an exception to the rule”. At the time of our founding, and virtually all history prior to that, the “rule” in the world was that people were controlled and oppressed by monarchs or some type of government that had ultimate power over the people. Most people had very limited freedom to live their lives as they saw fit. Opportunities to exceed beyond your “station in life” were essentially non-existent. Then along came the idea of the United States of America, where the people would have the ultimate power over their government, a classless society where opportunities for upward mobility were limitless no matter what you started out as or who your father was. The liberty enjoyed by the people would be unprecedented. America would be the “exception” to the rule, and for the most part, still is, although it is diminishing. Many of you may now be understandably suspicious of the legitimacy of these statements because you recognize the big and legitimate issue of slavery being a contradiction to everything I just said. And you’d be correct. The abhorrent and horrendous institution of slavery in America certainly provides evidence that these principles were not equally applied from the beginning. But as previously mentioned in Essay 1 – The Main Principles, this does not mean that the principles themselves are wrong, only that the application of them by the flawed men at the time was wrong. I will not “gloss over” or excuse slavery in any way. Nor will I ignore it in this series. Slavery will be discussed in greater detail in a future essay. Because it was and is such an exceptional concept, our self-governing, freedom loving, Constitutional Republic is often referred to as the “American Experiment”…an experiment that had never been tried before to this extent. Many did not believe it would or could possibly work. Of course, King George (who we just defeated in the Revolution in order to win our independence) was among those who couldn’t understand how people would govern themselves, but even our own George Washington had doubts that it would last more than about 20 years. And then there is Benjamin Franklin’s famous quote, where upon leaving Independence Hall at the close of the Constitutional Convention, he was approached by anxious citizens who asked him what form of government we will have. I sincerely believe we are on the verge of losing it. What Franklin was referring to was the responsibility of the people to remain informed and vigilant in protecting their own liberties and natural rights through the power of this new experiment of sovereignty of the people and self-governance. Having an electorate consisting of informed citizens is the key and Franklin (as well as many other founders) was not sure if the people would live up to that responsibility and, therefore, if self-governance was even possible for the long-run. It had never been tried before, so they had their doubts. In the end, thankfully, they decided it was worth a try. People today do not understand why America is exceptional. We need to learn and explain to others how it is the American idea of self-governance and maximum liberty that makes America exceptional, not just because we snobbishly believe we are better than everyone else or that we blindly cheer for “our team”, or that we have the largest, most powerful military. The People Are Sovereign! is a series of 30 essays that will be posted on a daily basis. 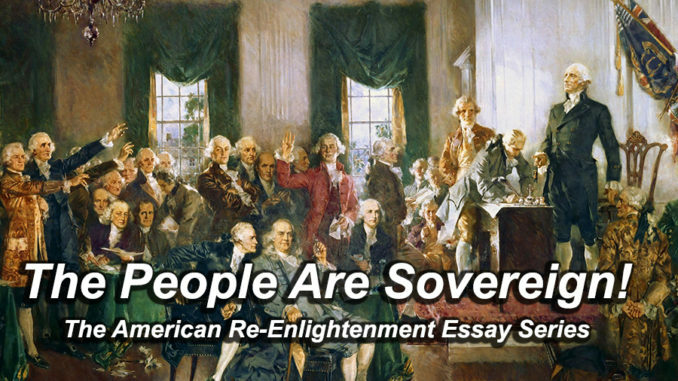 The series will continue tomorrow with Essay 3 – We the People.